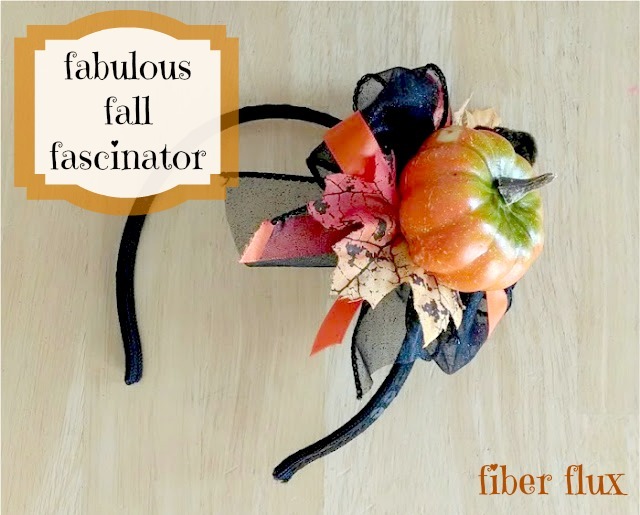 If you are in need of a little extra adornment this week or are unable to wear a full costume, here is a cute little project you can make...a fall fascinator! Using ribbon, some fall goodies, and of course a yarny accent...you can whip one up in no time. Some fallish accessories (silk leaves, pumpkins, netting, or pretty much anything you can think of! Next make loops, holding each one down as you go. Tie off with a scrap piece of yarn or ribbon. Do not trim yet. I found this autumn sprig of fall things at the craft store...pull it apart and decide what you'd like to use. I decided on the pumpkin and the two leaves. I placed the pumpkin in the middle first and wrapped the wire around the entire bow. Then I glued the leaves to the underside of the pumpkin. Finally, I added the crochet leaf (click here for pattern). Cute! If you want to give your fascinator a vintage look, add a bit of netting and let it hang down a bit. And tie it right to the headband securely. Next, cut a small circle out of the felt. And glue it to the back to hide everything and make it look more finished. All done! Be sure to let everything dry completely before wearing. Happy fall!